First patented in 1974, the Commercial Series Sectionizer allows you to not only sectionize citrus fruits, but also wedge apples and pears, slice tomatoes and mushrooms for sandwiches, or wedge them for salads. The machine can also slice or wedge hard boiled eggs, and small to medium onions and potatoes; basically, any fruit or vegetable that does not have a pit, is firm (not hard), and will fit through the blade cup. 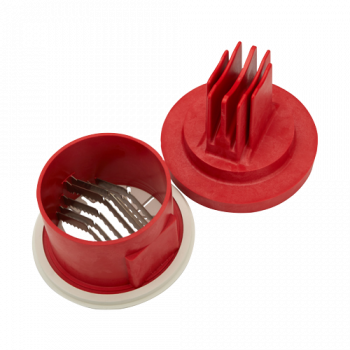 It is one of the most versatile food cutters on the market. Since the blades are extra sharp, as an added safety precaution, each one comes with a neoprene cup cover. It’s easy to remove the blade cups and plungers so they can go in the dishwasher to ensure ultimate sanitization. The sectionizer itself is made out of a sturdy ABS plastic, and is listed by NSF international. Extra-sharp blades ensure that fruit and vegetables will be cut with ease, saving you valuable time! We offer a variety of high-quality, stainless steel blade cups to fit your every need, including blades designed for apples, tomatoes, slicing into 6 pieces, as well as 4, 6, 8, 10, single pieces or 3-1 wedging! Sunkist first sprouted in 1893 and has been a household name for citrus fruits ever since. We have been solving food service industry challenges with practical and cost-effective equipment for decades! 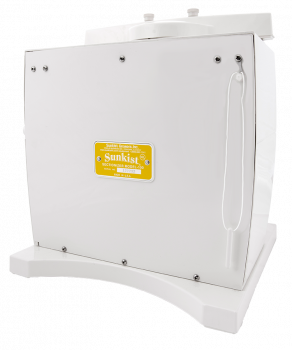 Sunkist ensures that you are well-equipped with long-lasting equipment that you can count on every day. We are so sure that this sectionizer will last for years without breaking, that we offer a one-year warranty!